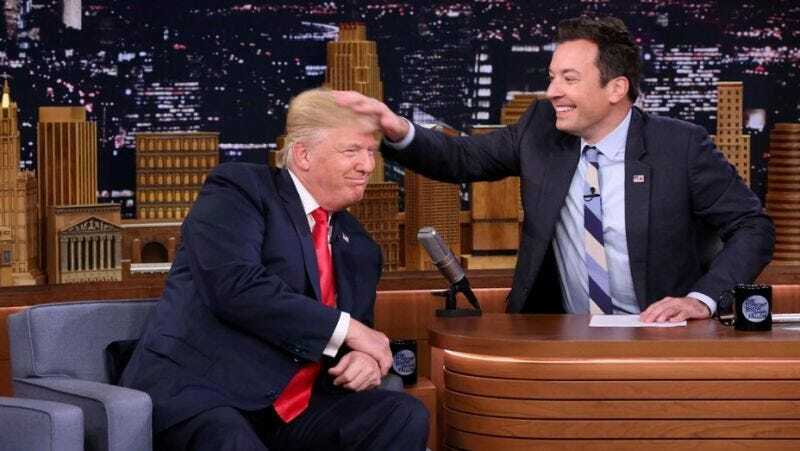 Remember during election season, when Donald Trump appeared on The Tonight Show Starring Jimmy Fallon? When the talk show host playfully ruffled Trump’s hair and didn’t even attempt to challenge him on his views or politics? Or racism? Or xenophobia? Or sexism? Or the fact that many of his supporters are white supremacists? Well, it seems as though Fallon has now had a change of heart and has issued a political statement about the brutal white supremacist rally in Charlottesville, Va., criticizing Trump in the process. “What happened over the weekend in Charlottesville, Va., was just disgusting. I was watching the news like everyone else, and you’re seeing Nazi flags and torches and white supremacists, and I was sick to my stomach,” Fallon said Monday night. Fallon went on to talk about how his daughters “don’t know what hate is,” and how the world needs a leader to look up to. Not the leader whose hair he played in previously. “The fact that it took the president two days to come out and clearly denounce racists and white supremacists is shameful,” he continued. Sure, we definitely can’t go “backward,” but Fallon, when you had a platform on which to condemn hate, you had a chance to help your daughters live under a leader who wasn’t hate-filled and who didn’t celebrate (secretly) seeing the world in flames. But, sure, your show isn’t political, and technically, it doesn’t have to be. But how about being aware and not afraid to challenge your guests with humor? It’s happened before. David Letterman definitely did it. Stephen Colbert does it. John Oliver does it. And when it wasn’t too late, too. Bye, Kinja! It's been fun (occasionally).